4th February, 2011. 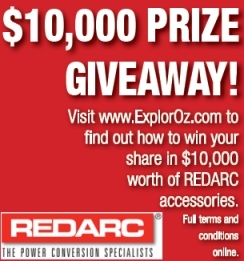 Get the latest scoop on our great new giveaway with $10K worth of Redarc products to be won!! Promotion starts today! Special Announcement - price of Membership now just $50 ! In this newsletter we launch the first of these promotions - offering you the chance to win a Redarc Electronic Brake Controller during February. In March, we'll bring you another great promotion with even more prizes from Redarc, and then another for April - May. Throughout the 4 months Feb - May, we have 2 other special promotions; one especially for Members (the Major Prize Draw), and another especially for new registered Visitors. To find out all about this fantastic promotion and to see full competition terms & conditions, see the Redarc Electronics profile page online here. Effective today, the price of ExplorOz Membership has dropped to just $50! This is not a limited time special offer, this is the new regular price of ExplorOz Membership so there's never been a better time than 2011 to join up! In keeping with our new resolution to "Keep it Simple", we've also brought the price of Joining and Renewal in-line so your Membership cost stays the same. For everything you need to know about becoming a Member, view ourMember information page (revised today), or join here now. During the month of February any new Member joining ExplorOz could be the lucky winner of 1 of 5 Redarc Electronic Brake Controllers (each worth $280.40). With prizes drawn each week, that's pretty good odds. Prize draw dates are: Tuesday 8th Feb, Tues 15th, Tues 22nd, 1st March (double draw). Every new Member in February 2011 will get a chance in each draw. Find out more about the Redarc Electronic Brake Controller here. Not only have we got prizes for Members in the Redarc Promotion, but anyone who REGISTERS (that's right, simply becomes a site "visitor") anytime from February until the 31st May, will go in the draw to win 1 of 9 Redarc Battery Isolators (each worth $165). 1 prize draw per fortnight throughout this entire promotion. Find out more about theRedarc Battery Isolators here. Better tell all your friends, and family... tell everyone, all they have to do is register! We haven't forgotten existing Members, and in fact this promotion will give anyone the incentive to become a new Member because at the conclusion of our Mega Redarc Promotion we will draw the Major Prize from our entire Member database. The Major Prize consists of 3 quality products for your vehicle from the Redarc accessory range - 1x Battery Isolator, 1x Battery Charger, and 1x Battery Management System with a total RRP $2,255. To qualify automatically for the Major Prize Draw (drawn on 1st June), all you need to do is make sure you are an ExplorOz Member by the close of business on the final day of the promotion - 31st May. Only 1 prize draw, unless unclaimed.See the full list of prizes here and don't forget to check competition terms and conditions to ensure you qualify. Think you know all about our Outback Heritage? At this time of year, we know many of you are preparing for upcoming trips to the outback. An excellent title in our bookshop Outback Heritage range is "Outback: The Discovery of Australia's Interior" by Derek Paster. This is a popular title, and contains a collection fo stories describing the many efforts that have gone into the exploration of our vast outback region. The book is a fascinating read! Also, Don't forget to check the new range of Super Specials out today - go to the ExplorOz Shop to see what's on offer.